By March each year I am done with winter and ready for spring. My niece assisted with this project which we made in March, 2013. It is a reminder that warm weather fun is just around the corner. NOTE: This could be equally cute with falling leaves or snowflakes! 1. Cut flower shapes out of the transfer sheets using a die cutter or scissors. Save any remnants to add a dash of sparkle to another project. 2. Iron t-shirt on steam setting, smoothing out all wrinkles. 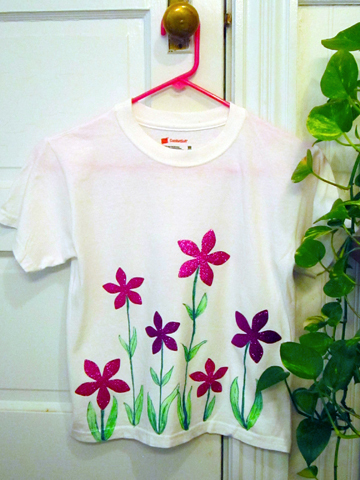 Arrange flowers on the t-shirt's front surface. Iron them in place following the manufacturer's instructions. Allow fabric to cool. 3. Use light green and dark green fabric markers to draw stems and leaves.